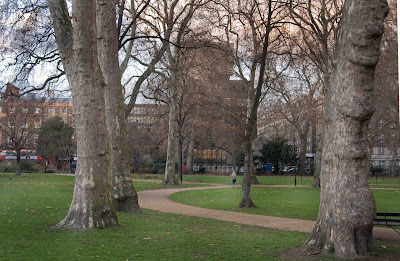 Parks that are lush and green in the summer, look like this in the winter. I notice a lot more detail in the buildings around them now, sometimes I see things I didn't notice before. The trees take on a whole new character with their knobbly trunks. At least the lawn is green for some warming color. I agree, you notice things we take for granted in the winter months. I have never been there! It looks peaceful! Nice green park, I like it. It is true how seasons hide or reveal the world arpund us. Interesting observation. Like how the path goes from the corner and leads you straight to the lone figure. That knobby trunk on the right is fascinating. Thanks for pointing these out. At this time of the year I turn into a real tree-hugger. There's something special about the light as well this time of year, especially out in the wilds of Kent where I live. Winter's not all bad!